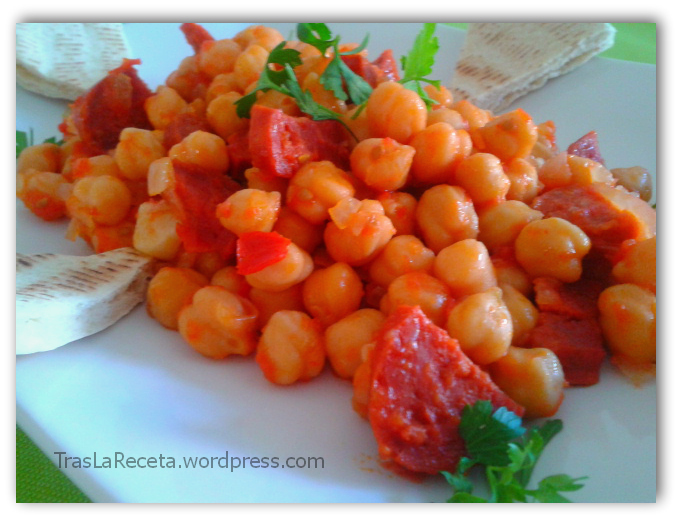 One of the first traditional dishes I tried when I came to Spain was Chickpeas with chorizo. A friend cooked up for me the recipe and since that moment the chickpeas with chorizo earned a privileged place into my kitchen. 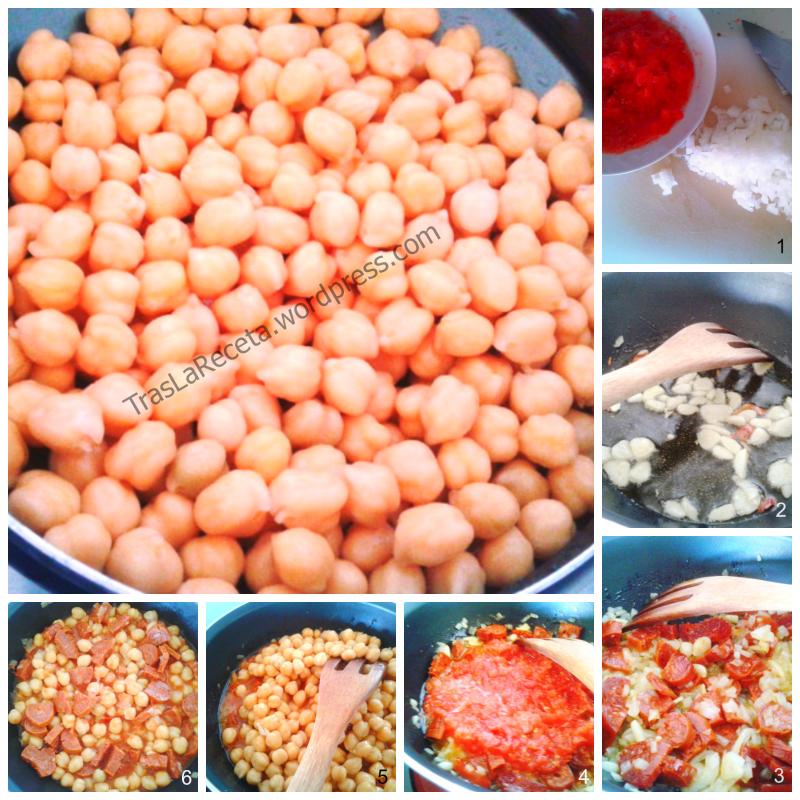 I prepare them very often, with different kinds of chorizo that always give a distinctive touch to the chickpeas. Which of them tastier? Actually I don´t know. No matter if you choose a sweet chorizo, spicy chorizo, fresh or traditional. The variety makes the richness. 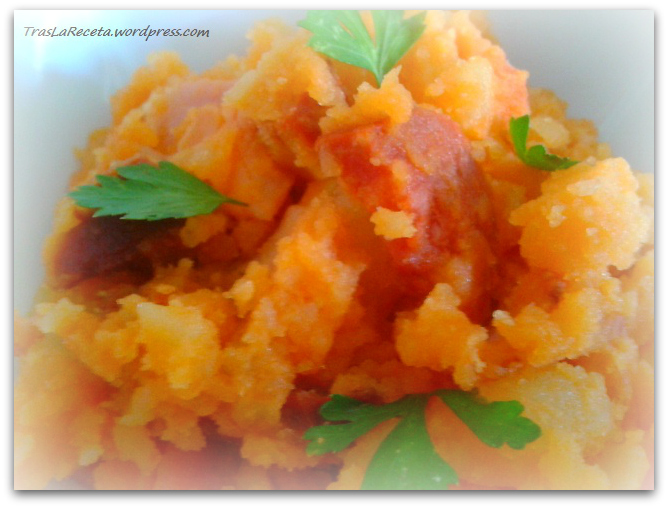 Because of this, our today´s recipe is prepared with turkey´s chorizo, delicious as well. 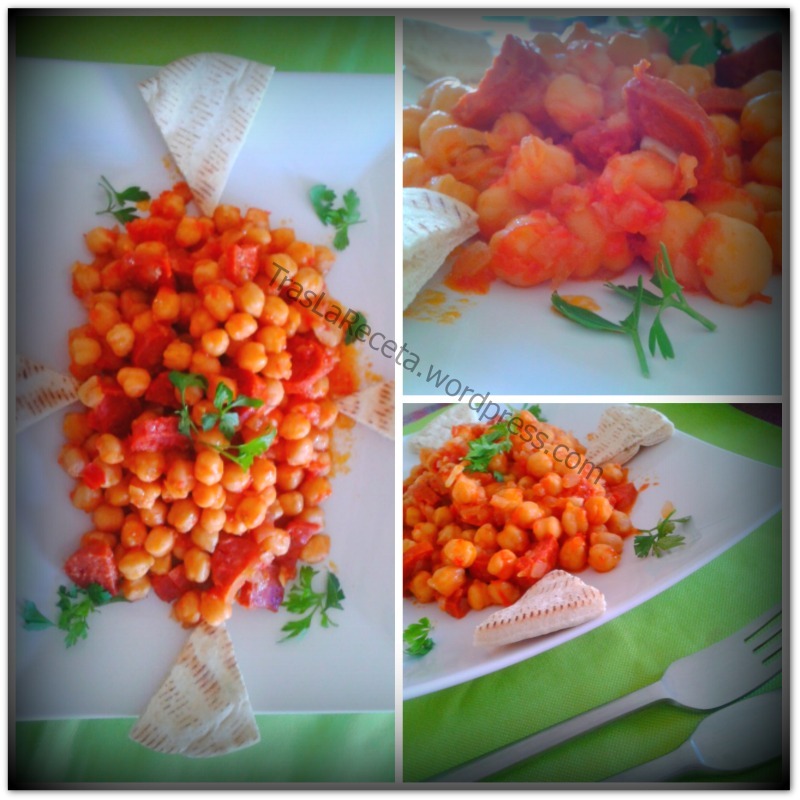 One aspect doesn´t change, at least in the way I cook up this chickpeas: whatever chorizo I choose, the tomato always is natural and ripe, grated just at the moment I´m going to use it. Without any doubt, the difference between preparing the chickpeas in this way and cook them with industrial tomato sauce is clearly palpable. Another point is that the chickpeas, the way they are made in Spain, they are taken out after cooked and are drained. 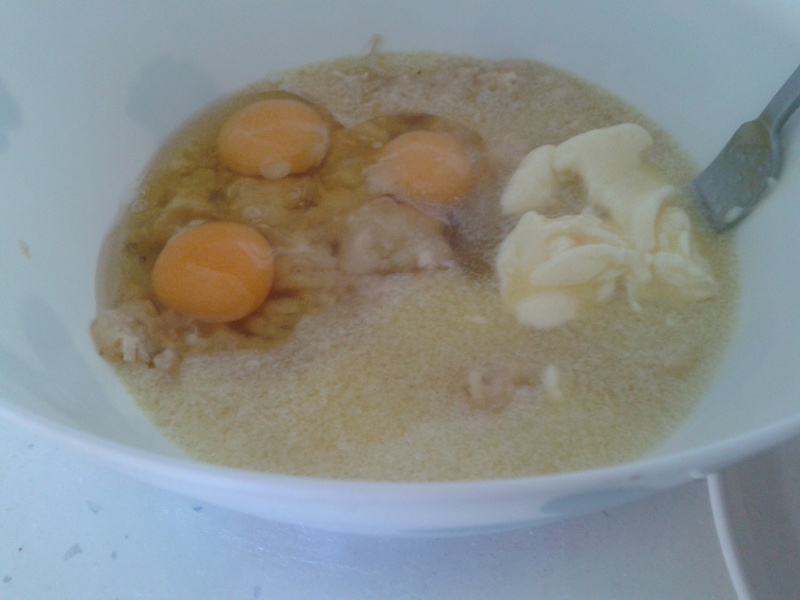 Then, they only take the grains in order to mix them with other ingredients. Because of this, you can use chickpeas already cooked or cook them yourselves in the way I explain later. 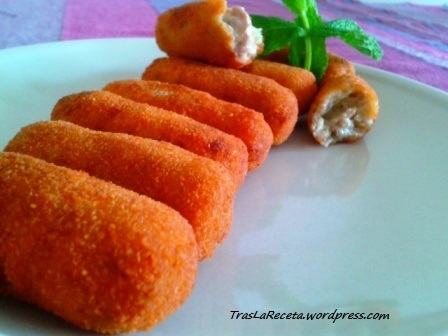 It is a very nutritious recipe, full of vegetables proteins, present in our chickpeas, and animal proteins as well in the chorizo. It is true that chickpeas need to be accompanied by pasta or rice in order to synthesize all amino they have and the organism need. For this reason I choose a low-sodium pita bread and the problem was settled. On this menu, onion and garlic strengthen the immune system; vitamins, minerals and lycopene present on tomatoes fight against cellular degeneration and cancer. So, it´s a healthy and tasty menu, isn´t it? 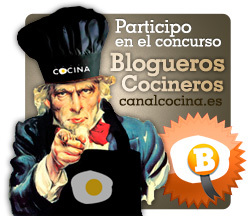 Let´s get into the kitchen. If you are going to cook the chickpeas, leave one cup (250 g) to soak the night before. Cook them with salt, 1/2 tsp of cumin, one bay leaf and one entire non peel garlic head. Into the pressure cooker they are 20 minutes, count from the start of the pressure´s release. Into a regular pot they usually cook during 45 minutes to 1 hour, depending on the strength of the grains. Be careful because it is not necessary very soft chickpeas. Drain them, throw away the garlic and the bay leaf and put aside. If you buy cooked chickpeas, wash them with cold water, drain very well and put aside in the same way. Heat the olive oil into a pan or into a clay pot. Add the garlic, laminated (if you cook the chickpeas do not put garlic), add the tip of chilli as well and let them golden. Incorporate the onion finely cut before the garlic burn and season with a pinch of salt. When the onion transparence add the chorizo, peeled and cut into half moons. 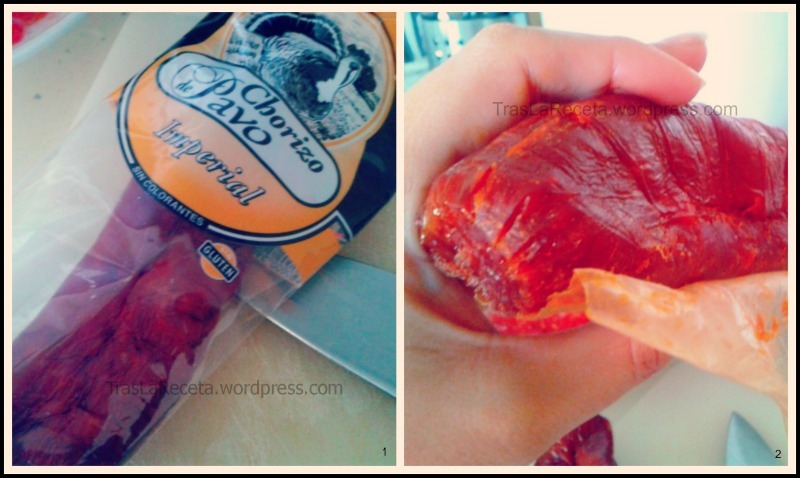 In order to peel the chorizo make a transversal cut and remove the skin with the tip of the knife. Sauté and add the tomato previously grated and seasoned with a bit of salt, stir to integrate everything. Finally, add the chickpeas well-drained, cover and let it cook 10 minutes. Two minutes before, uncover. Ready! Serve them in little pot clays or individual dishes and decorate with parsley. As you will be able to appreciate, they are better fried or sauté chickpeas than a chickpeas potage. 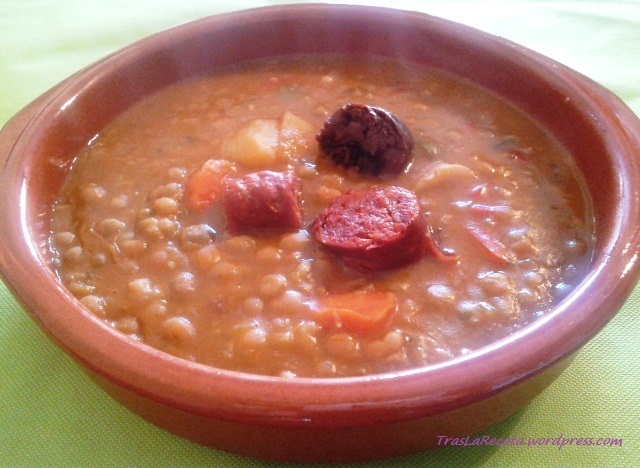 Here in Spain, chickpeas and legumes in general are usually cooked in the way of the popular Cocido Madrileño (Madrid Stew). I have the commitment of cook up a Madrid Stew as soon as winter permit this. Now, middle of August, no way. Impossible with the hot of the summer season in this part of the planet. For those people who read me in other latitudes, here you have this link. 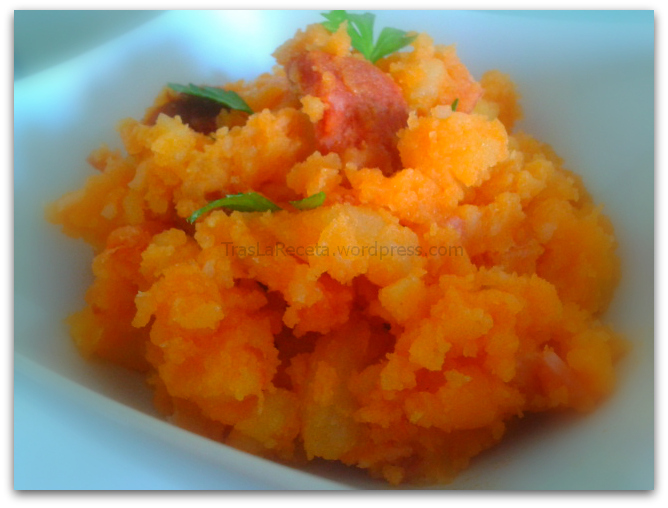 The recipe I share today, you can prepare it for 4 people as well, by doubling the amounts. About bread, if you are not hypertensive, choose your favorite, but if you do are, enjoy the chickpeas with white rice. 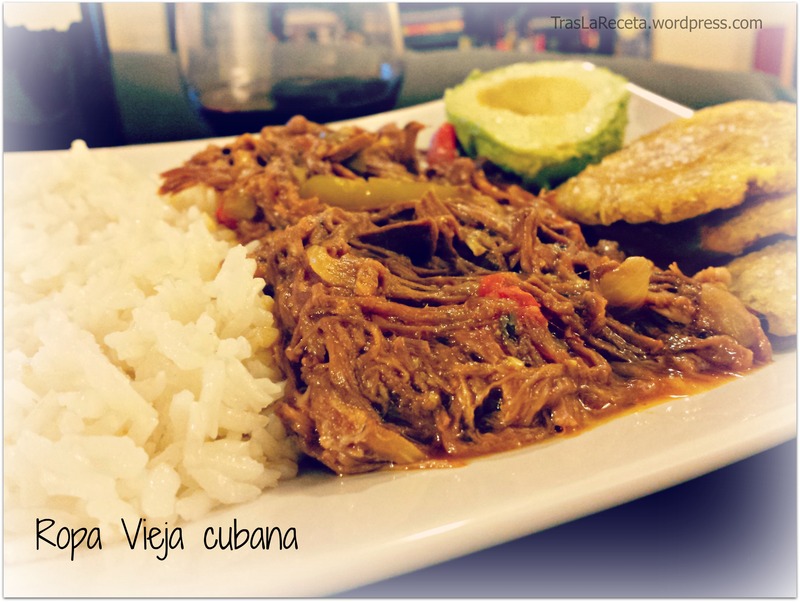 I hope you enjoy this recipe as much as I do every time I prepared it. 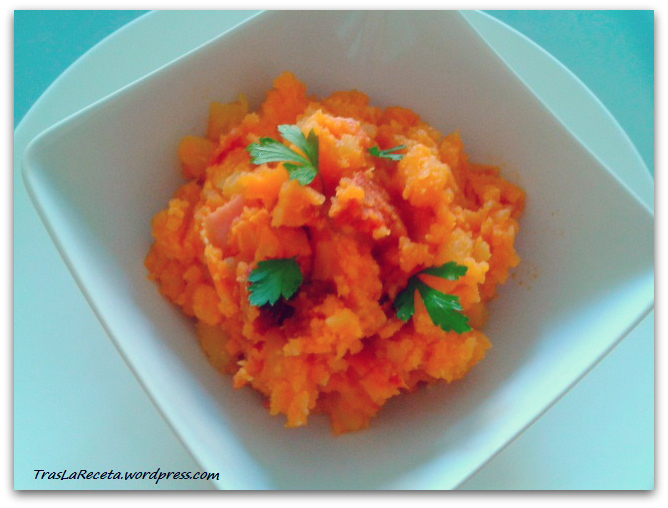 It´s a very easy and fast recipe to make even in those days we want spend less time into the kitchen. See you soon! Last summer I made my first Cordovan Salmorejo (Salmorejo cordobés) thanks to the great explanation I found at Javirecetas website. I loved that simple but delicious dish that hereinafter appeased hot, thirst and hunger. This season, as soon as barely heat was felt, I went to buy some good red tomatoes in order to prepare the first Salmorejo of the summer. Now, pear tomatoes and tomatoes branch are in their very best moment. The branch tomatoes are my favorites to prepare Salmorejo. I leave the pear tomatoes for our Andalusian breakfasts that we have every weekend, summer or winter, no matter which season be. The Cordovian Salmorejo is a very humble dish. It used to be prepared before Christopher Columbus brings tomatoes here from the New World. Because of this reason, before that, the Salmorejo used to be made just with vinegar, bread, oil and garlic, all perfectly crushed on a mortar. It was never on a court cook book. It was prepared and eaten by poor people and countryside people. There are two crucial moments for Salmorejo as we know it today. 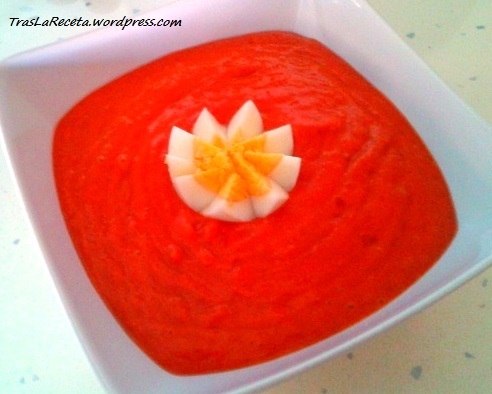 When tomato is introduced and the Salmorejo takes the red color (before that it´s used to be a white cream or soup), and a second moment it was when the electric blender was invented. It replaced the anterior primitive process. Historical references claim that Romans and Arabians, each of them, made and consumed the white primitive Salmorejo, hot or cold. Today the identified recipe as Cordovan Salmorejo is a little bit different, but tasty, fresh and extended for all the Spanish geography. Scald the tomatoes and leave them ready to use. Click here and you´ll be able to see how easily we can do it. 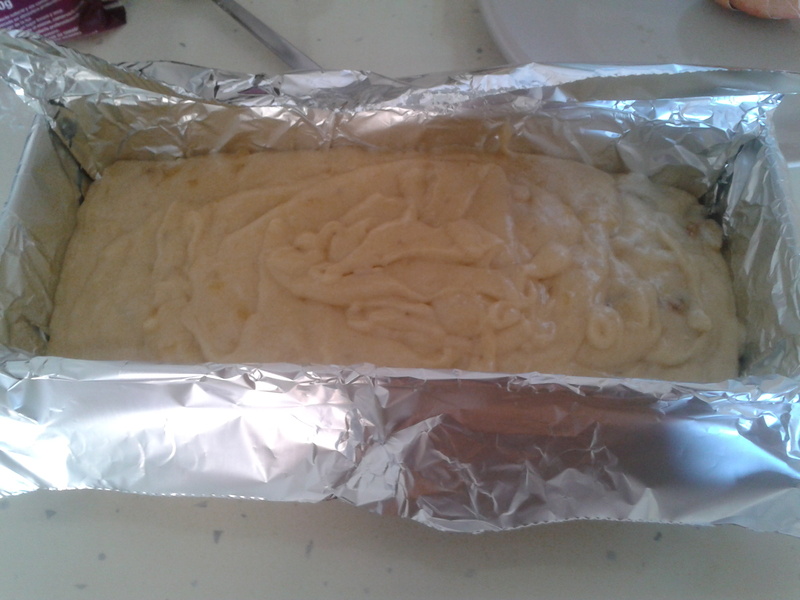 Put the bread, the tomatoes, the olive oil, the garlic and the salt into a container or into a blender vase. Blend as well as be possible. It won´t be necessary pass it through a Chinese strainer, but you can do it if you want. Leave the Salmorejo inside the fridge while you prepare a hard-boiled egg. Take it as an appetizer, as a menu starter or even as a light dinner substitute. Serve cold and garnish with diced hard-boiled egg and diced serrano ham.